That was the short version. This was my final project for a Masters in Interaction Design in CIID. If you want to know more. Here’s the transcript of the presentation I delivered on December 7th. I’m from Mexico City, and I have a multidisciplinary background. I studied Industrial Design, Design Engineering and Robotics, later worked as a Front End Developer and UI Designer, worked on Open Governments and Open Innovation, and then, I studied here, in CIID. Working on UI was an enjoyable period in my life but I wanted to find an area I could use more of my broad skills in — prototyping, coding and illustration as well as user-centred design — that’s why I chose to study Interaction Design at CIID. For my final project, I set out to work on something that would involve a few of my favourite things: gaming, coding, physical computing and illustration. That’s how I came to choose my area of interest: The connection between digital gaming and physical play. So, through this project, I mostly focused on the tactile experience that the digital world lacks. I found it fascinating. It’s a field not sufficiently explored. 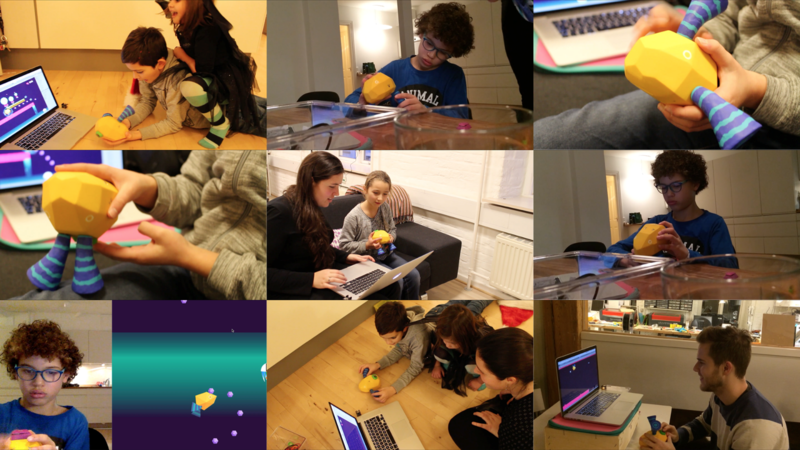 My project got me to look into physical interfaces, not only in gaming but in varied contexts. We are getting very used to thinking in screens. Objects and interfaces we regularly use become part of our interpretation of the world and how we think. 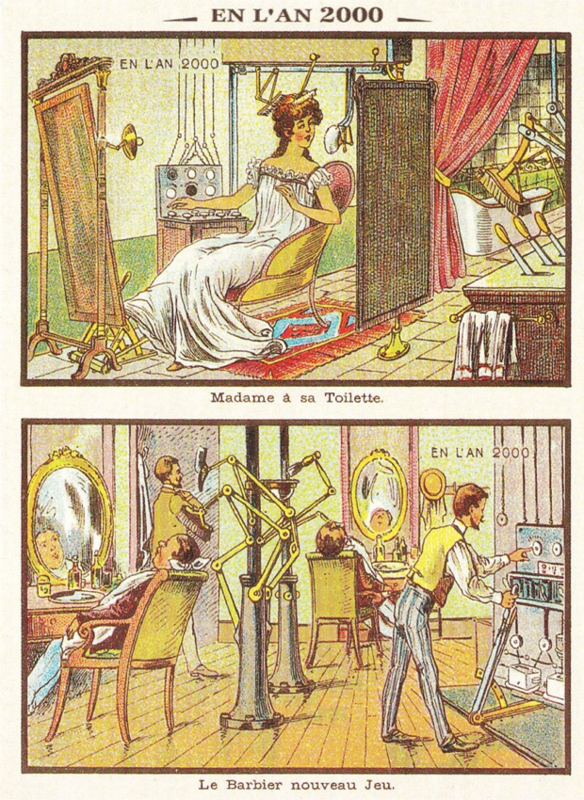 In the 1900s, for example, the future vision included lots of levers and personalised gadgets. The ideas were not general and all-purpose, but specific things to accomplish specific tasks. 2000’s, we saw a future full of touch screens and abstract interfaces. Everything would become a screen. 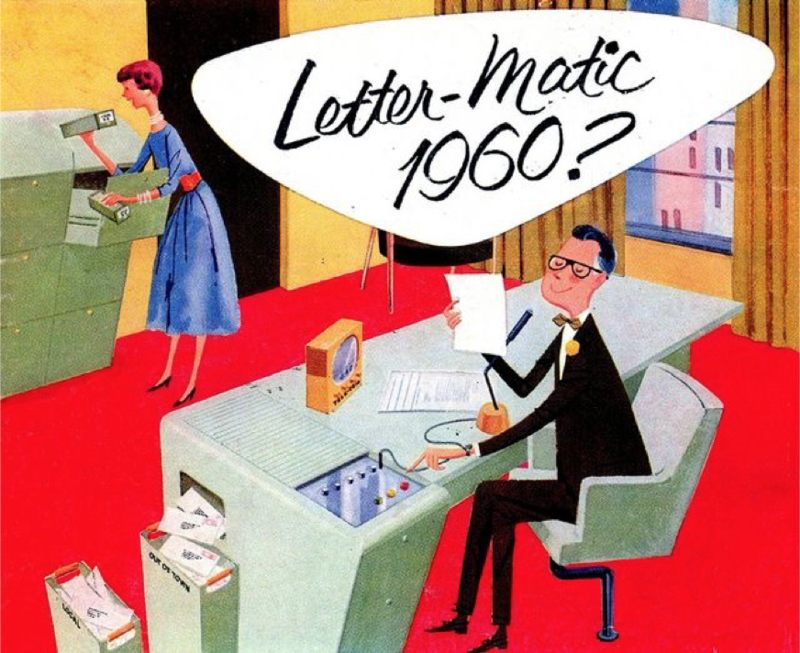 But now with Internet of Things, interfaces don’t have to be so generic and abstract. Anything can be an interface. I’m interested in more evocative interfaces. Especially for children. Not because they can’t understand screens. On the contrary. They grew up with them, they’re used to them. They think this way now. It’s normal for our brains to adapt to our technology. It happens to all of us… I mean, have you ever wanted to Ctrl+Z your life? I know I have. And sometimes, without consciously doing it, we try to have the real world imitate the digital one, instead of the other way around. I want to bring children out of a screen mindset. Think with their hands, build and play in 3D. What if they could use their toys for something else? What if everyday objects were our interfaces? 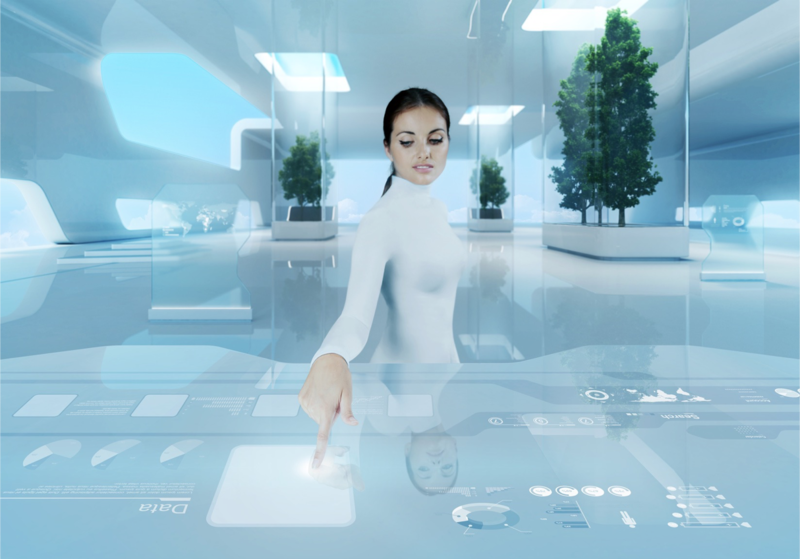 Physical, more “human” interfaces? I did some research on children’s games and toys. I visited children, 4 to 8, played with them, and got to know the toys and games they played with repeatedly. They had LEGO, but despite all its potential, they mostly built whatever the kit said and never used it again. Their iPad games, however, they could be glued to for hours. They showed me their games, taught me to play them, talked about the stories, and told me about their achievements and scores. So I set out to find what it is about digital games that is so attractive. I asked everyone I could find what they thought was best about digital games, and what was best about physical play. 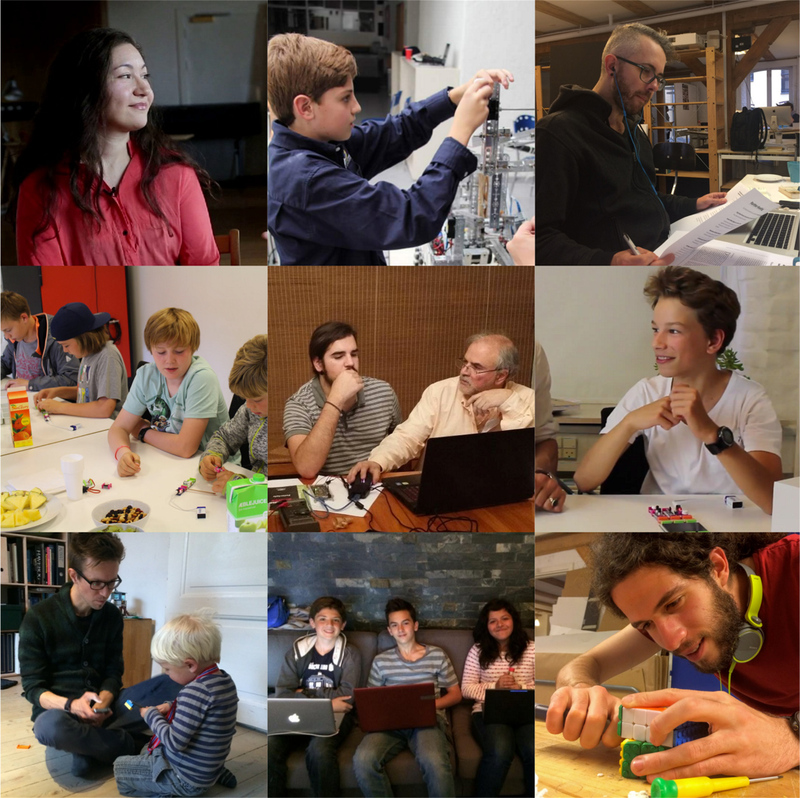 I interviewed 15 children (aged 4–14), 5 game designers, 4 game developers, 2 Engineering teachers, and 8 gamers. (it’s hard to categorise, for many of them do a little bit of everything, and most of them are gamers) Plus whoever was willing to talk about the subject for a few minutes. Clear goals and rules that provide a sense of progress. Whole world is your playground. So I looked into how to include the tactile experience and some of the freedom of physical play into digital gaming. Could you build your own world? Your character? Influence the game with your surroundings? I explored different paths. Augmented Reality I considered and discarded pretty soon, after a few Brainstorming and Co-Creation sessions, I settled on one thing. I wanted a toy that you could build, customize and it would then be your character in a game. So this is where the journey begins. Ziff has been evolving since the idea appeared. She has grown, shrunk down, and mostly adapted to better fit into her environment. Ziff’s journey had three main stages of evolution. Ziff’s first stage was pretty much a robot. A very simple robot with one motor, which, through gears, would generate different movements. So I sketched the different versions of this very mechanical Ziff. Built a quick version from Lego Mindstorms and animated it with physics in Unity. First encounter with Unity. I went through the gameplay with a few people, and got them to imagine what different configurations could be made, and what kind of challenges would be faced in the game. If you had to build her, how many variations could be made without it getting too complex to build without instructions? Where would the focus of the game be? With both the toy and the screen moving, you don’t know where to look.I had to face it, It was distracting. There were too many things going on. Plus, it was limiting. With physics, and using just one motor, there’s only so much that I can do. If she had this behaviours, RoboZiff character would have to behave the same way, which was just not interesting enough. It was very important to define where the focus would be at all times, and RoboZiff was all over the place. I took the idea of customizing behaviours and movements, but abandoned the mechanics. Decision made. A clear line was drawn between the physical interaction and the digital one. The child would build Ziff, and see Magic happen on screen! These opened up so many possibilities! I no longer had to obey the laws of physics completely, I could have all kinds of accessories, extra things that could be added to your toy. 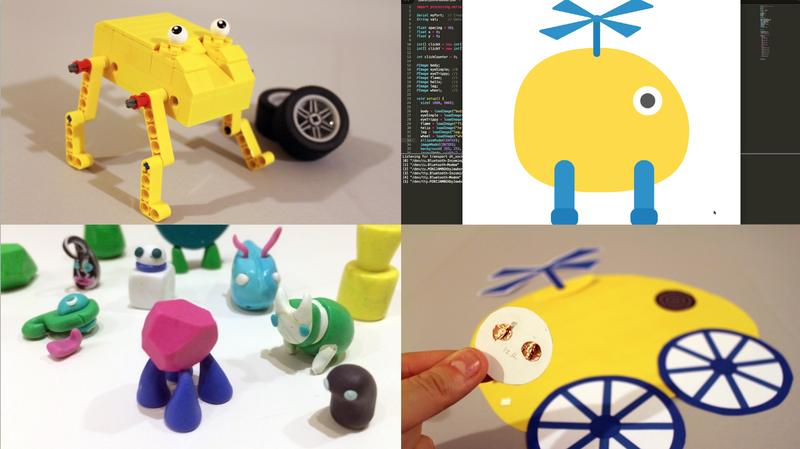 Prototypes, on paper, Lego, code, and polymer clay. It was time to define what kind of abilities the toy would acquire, what they would be used for, and what the game mechanics would be like. Made it out of paper, resistors, and Arduino, and tested it. I drew levels, I got people to “play with them” with paper cutouts, and experimented with the form and accessories the toy would have. At this stage, the toy had all sorts of things you could plug in. Legs, wheels, different eyes. There were too many accessories, it became like Barbie, a toy you could accessorize. So Barbie Ziff wasn’t so much fun. My users would try to use the accessories in different ways. They would put them in different places and ask what would happen. I thought that was more interesting, combination and placement over accessories. Again, I reevaluated, and narrowed down. Ziff shouldn’t have all sort of accessories, but rather she should have a very select few that would have different functions. What kind of things could you plug in that would generate different behaviours depending on the placement or combination? So. New Ziff was born. Ziff only has two legs and a set of power stones. Depending on where you place the legs, they do different things. place them at the bottom, she walks. On the sides, she swims! On top? See her fly! The power stones give her different abilities in combination with the legs. So again, build and test. Now the actual toy! Ziff was a space explorer that would go to different planets to save her friends. 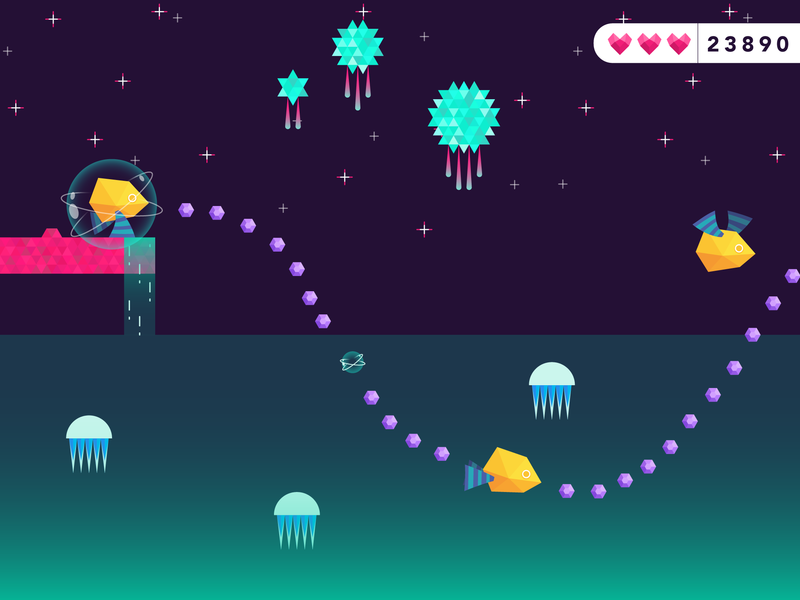 Every planet would have a different environment, and the child would have to build her toy before each level, and then play the level on the iPad. Very simple game, it would only have one control. Tap to move, don’t tap, don’t move. Time for some experience prototyping. Without building the game, I tested the gameplay with a few people, mostly talking it over or playing with paper cutouts. And I found there was something wrong. My users didn’t get why they had to build the toy and then all the playing would be on screen. Shouldn’t you use the toy as a controller in the game as well? And shouldn’t you be able to change configuration within the level? So I took those findings and adapted the toy and the game. Ziff would now have a button, inside of the core power stone, that would control the game. 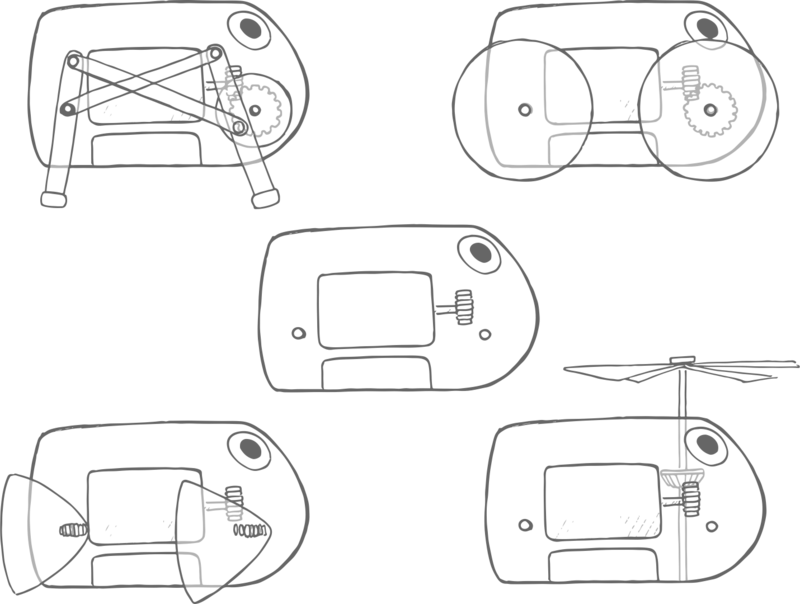 And since then, I’ve been building the game and the toy, testing and adapting. At this time Line Birgitte, one of my classmates, joined me, making the illustrations and animations for the game. Many things have changed in this process, of course, and that has mostly been learning about game design. Every single thing added to the game needs to be tested, every game mechanic and interaction. At one point, for example, it was very difficult because everything killed you. Either it was too hard because everything would destroy you, or I would remove those things and it would be boring. So I added good interactions as well, rewards. Here’s the trailer for the game, with actual gameplay footage and people using the toy. This past week I have had children test the game, they’ve helped me design levels, and I have made some changes to adapt to their reactions. It has been an amazing journey and I don’t want it to be over. I collaborated with Line while building the game, for she made the artwork, and we have had long discussions about gameplay. I met great game designers and developers, and became fascinated with game design and its potential. 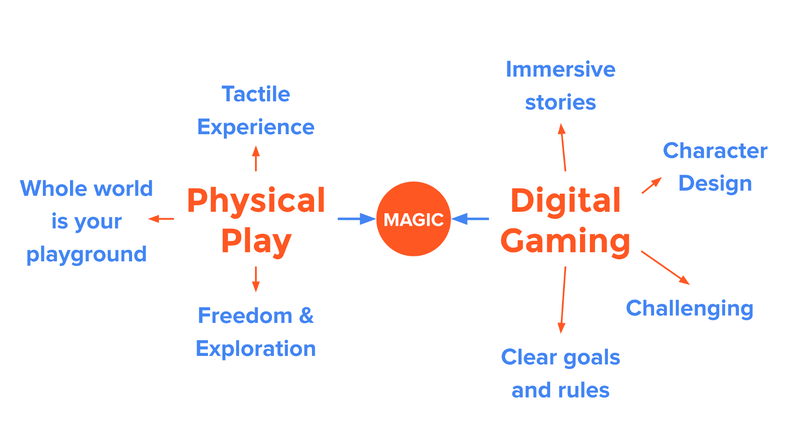 I believe there is still a great deal to explore on the connection between physical play and digital gaming. This could be a real thing! 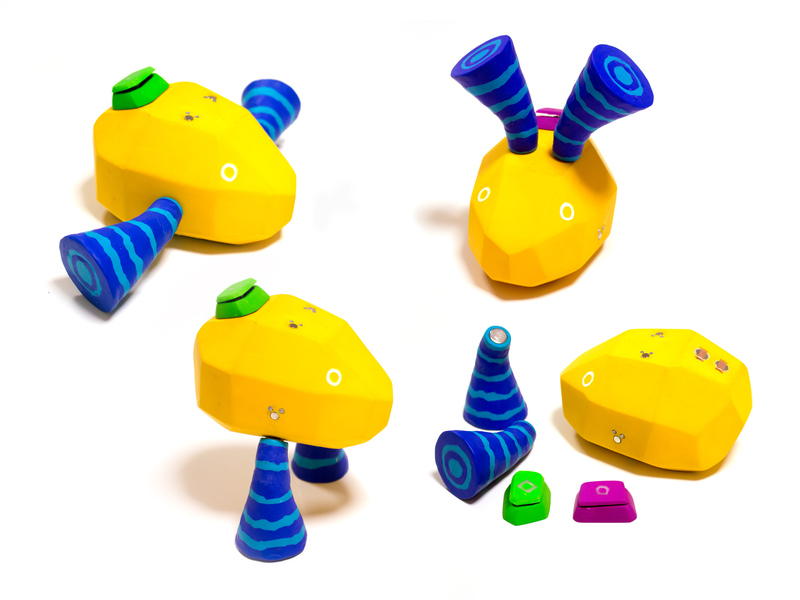 I plan to keep working on the game when I go back home, and the toy needs to be redesigned to make the connections sturdier and more reliable. Everything in this project is completely possible, and scalable. The electronics required are cheap, because there’s almost nothing happening inside of the toy, it just sends the configuration via bluetooth. And the game is scalable, since it was built with Unity and can then be converted to work on iOS, Android and other platforms.